More than ever, it is essential the body receive the necessary daily nutrients for sustaining and maintaining good health. If the multivitamin you take doesn't enhance the way you feel, you may not be taking the right multi for you. Futurebiotics� Hi Energy Multi for Men� is the definitive men's multi vitamin and mineral supplement that includes an array of nutrients, including antioxidant nutrients vitamins A, E and C and Selenium, and a full complement of minerals including Zinc, Calcium, Iron and Magnesium. In fact, Hi Energy Multi for Men� contains 100% or more of the recommended daily value of most nutrients. In addition, Hi Energy Multi for Men� contains specific herbs traditionally used to support men's health, including Saw Palmetto berries and Oat Straw extract (Avena sativa), along with adrenal glandular concentrate. It is part of a series of advanced state-of-the-art nutritional supplements designed especially for today's health-conscious man. A specially designed Hi-Energy blend includes such energizing botanicals as Korean (Panax) ginseng and Eleuthero root extracts plus Bee Pollen. Panax ginseng and Eleuthero root have been the focus of extensive research for enhancing endurance, while Bee Pollen has historically been used to gently support energy and an active lifestyle. Together they help promote energy without the jitters or anxiety associated with some energy supplements. Hi Energy Multi for Men� is stimulant-free. An advanced Rhodiola Complex is included to further enhance this one-of-a-kind men's supplement. Rhodiola rosea and Rhodiola crenulata extracts, each standardized for 4% salidrosides, have been shown to help reduce fatigue and promote vitality. They also provide adaptogenic support that provides an increase in the body's ability to cope on multiple physiological levels. Male Multiple Tablets is one of Solgar's premium-quality men's health products. More than ever, it is essential the body receive the necessary daily nutrients for sustaining and maintaining good health. If the multivitamin you take doesn't enhance the way you feel, you may not be taking the right multi for you. Futurebiotics� Hi Energy Multi for Men� is the definitive men's multi vitamin and mineral supplement that includes an array of nutrients, including antioxidant nutrients vitamins A, E and C and Selenium, and a full complement of minerals including Zinc, Calcium, Iron and Magnesium. In fact, Hi Energy Multi for Men� contains 100% or more of the recommended daily value of most nutrients. In addition, Hi Energy Multi for Men� contains specific herbs traditionally used to support men's health, including Saw Palmetto berries and Oat Straw extract (Avena sativa), along with adrenal glandular concentrate. It is part of a series of advanced state-of-the-art nutritional supplements designed especially for today's health-conscious man. A specially designed Hi-Energy blend includes such energizing botanicals as Korean (Panax) ginseng and Eleuthero root extracts plus Bee Pollen. Panax ginseng and Eleuthero root have been the focus of extensive research for enhancing endurance, while Bee Pollen has historically been used to gently support energy and an active lifestyle. Together they help promote energy without the jitters or anxiety associated with some energy supplements. Hi Energy Multi for Men� is stimulant-free. An advanced Rhodiola Complex is included to further enhance this one-of-a-kind men's supplement. Rhodiola rosea and Rhodiola crenulata extracts, each standardized for 4% salidrosides, have been shown to help reduce fatigue and promote vitality. They also provide adaptogenic support that provides an increase in the body's ability to cope on multiple physiological levels. More Than A Multiple� For Men is an energy rich mega-potency multivitamin developed on the principle that concentrates derived from whole foods are really the best approach to proper nutrition in a supplement form. In addition to essential vitamins and minerals, More Than A Multiple� For Men supplies your body with naturally occurring nutrients from whole foods, not found in many supplements. These energy-rich whole foods work synergistically with other nutrients to provide extra nutritional support in one convenient formula. Many multiples on the market today contain unnecessary levels of excipients and added ingredients. 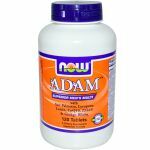 ADAM&trade; is formulated to contain the lowest levels of these unneeded additional ingredients, leaving more room for higher levels of the nutrients men need to maintain optimum health. *All other male multiples are now obsolete with the introduction of our new ADAM&trade; Male Multivitamin formula. Here's why:Contains 10,000 IU beta carotene from a vegetarian source, with mixed carotenoidsInositol hexanicotinate for vitamin B-3 - the superior form nutritionists recommendB-6 derived from P-5-P, a more bioavailable and efficient formB-12 as methylcobalamin, the most active co-enzyme formIncludes ZMA&reg;, a chelated zinc supplement popular with active individuals160 mg of Saw Palmetto - important for every man over 30100 mg of energizing Panax Ginseng - standardized for maximum effectiveness50 mg of the powerful metabolic antioxidant Alpha Lipoic Acid - rarely found in other multiples5 mg of CoQ10 and 30 mg of Ginkgo Biloba - ideal for men of all ages - guaranteed potenciesHigh levels of Lycopene and Lutein, carotenoids critical for prostate and eye healthIron-free formula offers the best value on the market for premium male multiplesAvailable in both tablets and vegetarian Vcaps&reg; Male Multiple Tablets is one of Solgar's premium-quality men's health products.